In my paper about the Inca King named “MANCO CAPAC”, I had noted that his title, as written on the drawing representing him, was a writing in the form of “MANGOCAPACINGA” which was sectionalized as MANGO:CAPAC:INGA. Without the sectionalizing, the writing “MANGOCAPACINGA” was read in Turkish as “MEN GÖK APA GÜNCİ” meaning “I am Sun believing Sky-Father” which he was known as being. But the name “MANCO CAPAK” did not seem to express such a title for this Inca king. Clearly, his title name “MANCO CAPAK” was rather an anagrammatized form of an expression in Turkish which described him as “I am Sun believing Sky-Father”. This indicates that his kingly and godly title name was Turkish originally, but in spite of that fact, it was confused into a non-Turkish format so that it could not be recognizable as Turkish by sight or by hearing. Yet, the decipherment of his title name into Turkish reading provided an understanding that described his kingly and godly position in Inca society. Similarly, there are many other so-called Inca words that appear to have been anagrammatized from Turkish and they can be deciphered and their Turkish contents can be recovered. Some of these words I will discuss below. The people who did the alteration must have been well experienced in confusing Turkish language words and sayings into Aryanized formats. They must have used the same experience in altering the Inca language. The native peoples of ancient Iberian peninsula (so-called “PAGANS”), contrary to what has been advocated of them as being “Romans and Indo-Europeans”, were originally ancient Turanian Tur/Turk/Oğuz peoples before they were Aryanized and Christianized. In that operation, words and sayings of Turkish were confused, distorted and Aryanized into some new languages that they called “Indo-European” languages of Europe - that never existed before. Additionally, the Turanian Turkish identity of the native Europeans was changed into an Aryan and Christian identity. Finally, their ancient Sun religion was destroyed - as the Sun religion of the Incas was also destroyed. All of the European natives, that is, the so-called “PAGANS” were Christianized and Aryanized in this manner. With all this experience, when the time came for the Roman Christians to go to the Americas, they were already equipped with better arms and also with the experience of how to take over, Aryanize and Christianize the native peoples. Additionally, it is most likely that the Spanish forces who went to South America already had the knowledge of the Turkish language from their previous experience with native Turanians of Europe, and when they met the Turkish speaking Inca peoples and the other native peoples of South America, most likely they pretended that they did not understand them, when in fact they did. Hence, the Inca conversations were wide open to the Spanish forces, while Inca people did not understand the Spanish. With this secret linguistic weapon, the conquistadors had full advantage of the situation over Incas. Alternatively, if we decipher the word CASTELLANIZACION letter-by-letter as “ZINCANA-TILCE-OLAS”, it reveals its source as the Turkish saying “ÇİNGENE DİLCİ OLUŞ” meaning “becoming Gypsy language speaker”. In other words, in both cases, when a native people are Hispanized, their language is converted to a “Gypsy” language, that is, an altered, confused and some kind of Aryanized or Semitized language. When the new generations of the targeted group are schooled and trained in the new language, then, they grow up into being the speakers of a Gypsy language which may be the language of the converter or a language similar to that of the converter. Thus, without being aware of it, they become regarded as a “Gypsy” nation. On the top of it, when they are converted into another religion, then they become a totally different people than their forefathers were. Evidently, this is how the country name MASAR (MISIR) of ancient Turanian Tur/Turk/Oguz people was changed into the name “EGYPT” meaning “Gypsy”. This alteration and conversion were done by the priests of new cult religions of the time. These priests were so powerful that they neither recognized the rules (laws) of the land nor they recognized the commands of rulers of the country. These priests assumed the falsehood that they were the intermediary between the public at large and the Gods of Sky. Similarly the Native Turanians of ancient Europe and the native South Americans were forcefully and deceitfully Aryanized and Christianized. In other words, a target language can be turned into a “GYPSY” language, that is an Indo-European and Semitic language, by artificially changing, confusing and restructuring the words and sayings of the target language. The target language of this deceitful attack was the ancient Turkish language of the ancient Turanian peoples. Countless numbers of so-called “new nations with new languages” were fabricated from the Turkish language and Turanian peoples during the last few thousands of years. Most of the South American natives, including the so-called INCA people, were ancient Turanians who spoke the monosyllabic and agglutinative language of Turkish. The words and expressions of Turkish were easy to confuse and thus become unrecognizable as Turkish. Individual words could be easily concatenated and garbled. Syllables in the Turkish words and expressions could easily be moved around, dislocated and displaced, consonants would be readily changed with other substitutions, vowels would be dropped, moved around or replaced with other vowels, thus, the initial text would end up in a totally disfigured and corrupted state. And, that is what we are observing in the Inca language as well as in the languages of other native South Americans. In the Inca language, there is the word QUIPU meaning “an ancient Inca writing system with knotted-strings”. “Recent work by Gary Urton, a renowned Harvard-based scholar of the Inca, suggests that the QUIPU was much more than just remembering numbers and accounting information. If his hypothesis is correct, the QUIPU was an astonishingly sophisticated three-dimensional system based on binary code, like modern computers. In my view, in the Inca QUIPU system, a bundle of quipu strings may be likened to a book where each knotted-string or series of strings could be likened to a page of a normal book. If the knots on the strings, in addition to having numerical information, also have syllabic information of the Inca language, it would then be like a page of writing that was written on a string. In this study, I will show that there are INCA words or altered Inca words that seem to be made up from Turkish words and sayings. The word QUIPU is one such word! Polat Kaya: Inca QUIPU is an ancient writing system that uses knots along strings. Inca words QUIPU, KHIPU, KIPU are defined as: (1) A knot. 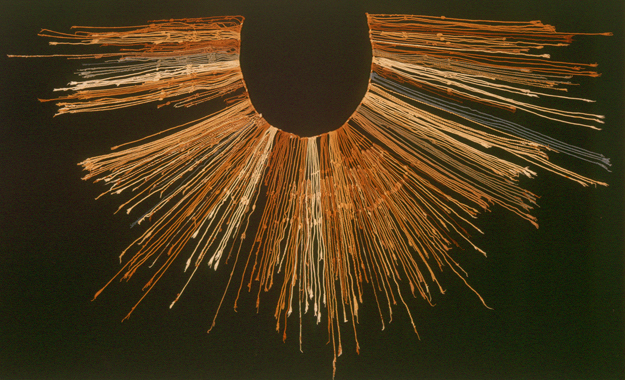 (2) A system by which the Incas kept records of various things with knots made in string. Actually, the so-called Inca term QUIPU, although the system uses “knots on a string”, is a combination of two Turkish syllabic words concatenated. Turkish words are: İP meaning “string” and UKU (OKU) meaning “read” for which the root word is Turkish verb “OKUMAK” meaning “to read”. Thus, the Turkish form for QUIPU would be “İP OKU” (or OKU İP) meaning “string reading” or “read string”. From this, it seems that the so-called Inca QUIPU system is a writing and reading system in three dimensional space. The very fact that the word QUIPU uses the Turkish word OKU, indicates that it was a writing system rather than just a system of remembering numeral information. The Inca peoples were a confederated empire of different groups of Turanian Tur/Turk/Oguz peoples in South America. We will see more evidence of this fact as we examine more words related to Quipu. A sample of Quipu knots. 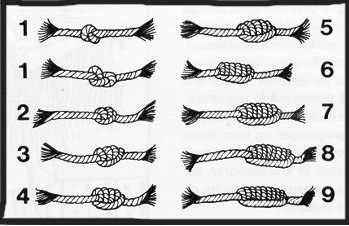 Numbers were represented by an increasing complexity of knots. 1. The supposedly Inca word QUIPUCAMAYO: (n) is said to mean “A bundle or string of knotted strings.” In this context, the Inca word QUIPUCAMAYO, deciphered letter-by-letter as “OQU-IP-YUMACA”, reveals the Turkish saying “OKU İPİ YUMAĞI” meaning “bundle of read-strings”. This clearly shows that the Inca word QUIPUCAMAYO is an altered and restructured form of the Turkish saying “OKU İPİ YUMAĞI”. In this decipherment into Turkish, the Turkish word OKU means “read”, İP means “string”, İPİ means “the string”, YUMAK means “bundle”, YUMAĞI means “the bundle”. If Inca people were not Turkish speaking people, there would be no chance of finding this kind of exact correspondence. 2. The supposedly Inca word QUIPUCAMAYOQ: (n) is said to mean “Keeper of oral history.” The Inca word QUIPUCAMAYOQ, deciphered letter-by-letter as “QU-IPA-OQUMACY”, reveals the Turkish saying “OKU İPİ OKUMACI” meaning “the reader of quipu strings”. This again clearly shows that the Inca word QUIPUCAMAYOQ is also an altered and restructured form of the Turkish saying “OKU İPİ OKUMACI”. Again in this decipherment into Turkish, the Turkish word OKU means “read”, İP means “string”, İPİ means “the string”, OKUMACI means “the reader”. If Inca people were not Turkish speaking people, there would be no chance of finding this exact correspondence. 3. The supposedly Inca word QUIPUCAMAYOCS: (n) is said to mean “khipu specialist.” The Inca word QUIPUCAMAYOCS, deciphered letter-by-letter as “QU-IPA- OQUMACSY”, reveals the Turkish saying “OKU İPİ OKUMACISI” meaning “the reader of quipu strings”, that is, "khipu specialist". This shows that the Inca word QUIPUCAMAYOCS is an altered and restructured form of the Turkish saying “OKU İPİ OKUMACISI”. Again in this decipherment into Turkish, the Turkish word OKU means “read”, İP means “string”, İPİ means “the string”, OKUMACI means “the reader” and OKUMACISI means “the special reader”. Again I say, if Inca people were not Turkish speaking people, then, there would be no chance of finding this exact correspondence. The last suffix SI in Turkish makes the quipu reader a specialist. Evidently the anagrammatizer who altered the Turkish sayings of the Inca people knew the Turkish language and its specialties very well. Thus, he was transcribing the Turkish saying into an intentionally confused form of language. In addition to the above given Turkish sayings embedded in the given Inca words, we also have other Turkish sayings which are embedded in these Inca terms and are very relevant to Inca quipu reading. 4. The supposedly Inca word QUIPUCAMAYOQ: (n) means “Keeper of oral history, the keeper of the quipus.” The Inca word QUIPUCAMAYOQ, deciphered letter-by-letter as “İP-YACU-OQUMAQ”, reveals the Turkish saying “İP YAZU OKUMAK” meaning “to read string-writing”. This decipherment into Turkish refers to “quipu” as a “writing” system. Turkish word İP means “string”, YAZU means “writing”, OKUMAK means “to read”. This decipherment identifies the QUIPU as a “writing” system. 5. The supposedly Inca word QUIPUCAMAYOQ: (n) means “Keeper of oral history, the keeper of the quipus.” The Inca word QUIPUCAMAYOQ, deciphered letter-by-letter as “İP-OQUYUCA-QAM”, reveals the Turkish saying “İP OKUYUCU KAM” (İP OKUYUCU ŞAMAN) meaning “shaman who reads string-writing”. This decipherment into Turkish refers to “quipu keeper” as a “shaman” who reads the strings. Turkish word İP means “string”, KAM means “shaman”, OKUYUCU means “he who reads”. Among the Incas there were many Shamans (Turkish KAM) and still many exist presently! “QILLQA, QELQA, KILLKA, QUILLCA: (n) Letter (both meanings); writing; scripture; sign. Hieroglyphs carved by the Inca into the stones of their temples and in the vicinity. Their significance remains unknown to Westerners. A drawing. (v) To draw, to write. Now, when we decipher letter-by-letter the name CELCAKAMAYOC into Turkish as “YACECA-ULMAK-C”, it reveals the Turkish saying “YAZICI OLMAK” meaning “to become writer”. The left over letter C is just a wrapping letter. Evidently, this Turkish saying is embedded in this Inca word. Similarly, when we decipher letter-by-letter the name CILLCAKAMAYUC into Turkish as “YACICA-ULMAK-LC”, it reveals the Turkish saying “YAZICI OLMAK” meaning “to become writer”. Evidently, this Turkish saying is also embedded in this Inca word. Finally, when the Inca word CELCAKAMAYOJ is deciphered letter-by-letter as “YAJECA-OLMAK-C”, this also reveals the Turkish saying “YAZICI OLMAK” meaning “to become writer”. Evidently, they all corroborate each other in meaning in Turkish. They all mean “to become writer” as they are said to mean “writer” in the Inca language. Furthermore, when the name CELCAKAMAYOJ is deciphered as “ACELA-YAJMAK-O”, it reveals the Turkish saying “AKILI YAZMAK O” meaning “it is to write what is in mind”. This definition is indeed the definition of the concept of “writing” down what is in mind. Turkish word AKIL means “mind, knowledge and wisdom” and that is what people write down when they want to write something on paper or on some other medium. The above Inca words also mean to draw something or “drawing”. When the word CELCAKAMAYOJ is deciphered as “OYALA-CEJMAK-A”, it reveals the Turkish saying “OYALA ÇİZMEK O” meaning “it is to draw something or drawing something at random (for idleness or having nothing better to do).” In any case, a drawing is a drawing whatever may be the outcome! This definition is also the definition of the concept of drawing something. So, the word CELCAKAMAYOJ also means “drawing” as the Inca word is said to mean. In view of these findings, it can be said that the Inca terms qillqa, qelqa, killka, quillca are not only the front parts of the words QILLQAKAMAYUQ, QELQAKAMAYOQ, QELQAKAMAYOJ, but also they get their meanings from the Turkish words YAZICI, YAZMAK and ÇİZMEK all embedded in the same Inca words QILLQAKAMAYUQ, QELQAKAMAYOQ, QELQAKAMAYOJ or the common word CELCAKAMAYOJ. Quipucamayoq with a quipu, drawing by Felipe Guaman Poma de Ayala. Polat Kaya: This picture shows an Inca man (Quipucamayoq) with his Quipu writings – which looks like an open book. In my above analysis of the word QUIPUCAMAYOQ, in addition to some other relevant meanings given above, this Inca term has the Turkish saying “OKU İPİ OKUMACI” meaning “the reader of quipu strings”. This describes the man as the reader of such quipu writings. In my second decipherment, QUIPUCAMAYOQ was found to contain the Turkish saying “İP OKUYUCU KAM” meaning “shaman who reads string-writing”. Polat Kaya: This picture reminds us of a solar eclipse where the “black moon” has gone in front of the sun and sunlight has been blocked and darkened. European writers claim that the Inca Sun had been eclipsed after the Spanish conquest and Christianization of the native peoples of South America. This picture of a Quipu on a black background seems to represent an eclipsed sun – as if to remind the Inca people about the fall of their magnificent Inca Empire. In closing this writing, I should also note that the Inca QUIPU writing system reminds me of the so-called Old Irish writing system of OGHAM (also OGAM, OGHMA) – a writing system that writes with short lines written above and below a reference central line. It is said that the Celtic deity called OGMA invented the Ogham alphabet, which is named after him, [http://en.wikipedia.org/wiki/Ogma]. OGMA personified good speech and writing. The name OGMA is important, because the Celtic term OGMA (OGHMA) is just another form of the Turkish word OKUMA (OGUMA) meaning “writing, reading and schooling”. That is why OGMA is personified as the god of writing, reading, learning and good speech. My identification of OGMA as being the Turkish “OKUMA” unquestionably ties the so–called Celtic people to the Turanian Tur/Turk/Oguz peoples! Ancient Turanians invented the writing system and spread it all over the world! Additionally, Oghma (/ˈɒɡmə/ OG-mə), also known as The Lord of Knowledge, Binder of what is known, is the Neutral Greater power of Bards, Inspiration, Invention, and Knowledge,of the Celtic pantheon and also within the fictional world of the Forgotten Realms Dungeons & Dragons campaign setting. Ogham /ˈɒɡəm/ (Modern Irish [ˈoːmˠ] or [ˈoːəmˠ]; Old Irish: ogam [ˈɔɣamˠ]) is an Early Medieval alphabet used primarily to write the early Irish language (in the so-called "orthodox" inscriptions, 4th to 6th centuries), and later the Old Irish language (so-called scholastic ogham, 6th to 9th centuries). The so-called Irish term LUGH or LUG is the altered form of the Turkish word OGUL (OKUL) meaning “school” where all of those knowledge fields mentioned above are introduced to students. After all, the European Romans and Churchmen had already taken the Turkish word OKU to manufacture English “SCHOOL”, French “ECOLE” and Lithuanian “MOKYKLA” from Turkish “OKUMAK” meaning “to read and learn” and “OKULAM” meaning “my school”. For sure, Christian missionaries also altered the Inca language and its Turanian words – as they did with the original Irish language and writing system. They seem to have gone there to get the gold and all other riches of the native peoples and while looting it, they destroyed everything the Inca and other natives created as their culture and civilization. Spanish Conquistadors considered Quipus as idolatrous and paganism, and therefore, destroyed many of the Quipu writings by burning them.